80586 Private Joseph Clark, 3rd Battalion, the Durham Light Infantry was killed in action 23 October 1918 and is buried at La Vallee-Mulatre Communal Cemetery Extension. He was about 24 years old and is commemorated on the West Auckland War Memorial. In 1891, the family lived at Cockfield and 31 year old John worked as a coal miner. In 1901, the family were still at Cockfield and John was a coal miner (hewer). By 1911, the family lived at Mayfield Terrace, Cockfield. John worked as a coal miner (hewer), 26 year old William was a coal miner, 20 year old Joseph and 16 year old Cornelius worked as coal miners (putters). In 1918, Joseph married Ada Barker. In 1911, 13 year old Ada lived with her father Robert Barker at 9 Maude Terrace, St. Helens Colliery. Being a coal miner, he may well have served with 1/9 DLI in a Pioneer Battalion. By 11 October British forces had closed up upon the retreating Germans, now hastily dug-in immediately to the east of the River Selle. Haig initiated a series of operations designed to get British troops in strength across the river and clear a way for a move against the Sambre-Oise Canal – 5 miles to the east. Thursday 17 October: 5.20qm, after a 6 day halt for preparations and artillery bombardments Fourth Army troops attacked in thick mist. Infantry and tanks, preceded by a creeping barrage, moved forward on a 10 mile front south of Le Cateau. The centre and left of Fourth Army forced crossings of the river despite unexpectedly tenacious enemy resistance and much uncut wire. Fighting was particularly fierce along the line of Le Cateau-Wassigny railway. The right of the attack across the upland watershed of the Selle made most progress and by nightfall enemy defences had been broken and Le Cateau captured. 18 & 19 October: severe fighting continued by which time the Fourth Army assisted by the First French Army had advanced over 5 miles, harrying the enemy back towards the Sambre-Oise canal. 20 October: In an early morning attack, Third Army formations secured the high ground east of the Selle. There was a day’s pause to bring up heavy artillery. 23 & 24 October: the attack was renewed with a major assault by the Fourth, Third and First Armies which resulted in further gains. 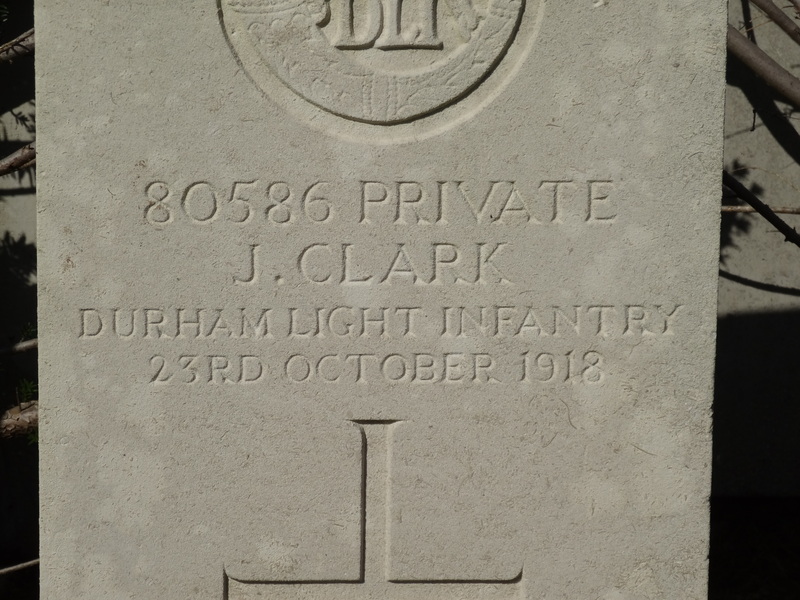 Private J. Clark was killed in action 23 October 1918, the circumstances of his death have not been researched. Private J. Clark was awarded the British War and the Victory medal. Private J. Clark is buried at grave reference A.19 La Vallee-Mulatre Communal Cemetery Extension. He is the only soldier from the DLI buried in the cemetery and the majority of the infantrymen served with the 1st Division. 1891 census Note: There are other people named Joseph Clark born in the County at for example Cornforth, Stanley and Byers Green but there are few family, cultural ties to these areas therefore the “Cockfield” Joseph Clark may be the most likely.